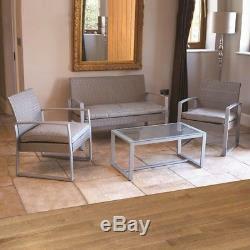 This garden furniture set includes glass top table, settee and 2 armchairs. 6cm thick grey seat cusions. Rectangular shape tempered glass top coffee table. Simple & easy to assemble. Our stunning rattan furniture set is ideal for all gardens, patios, decking and conservatories. Our stunning rattan furniture set is ideal for all gardens, patios and decking. 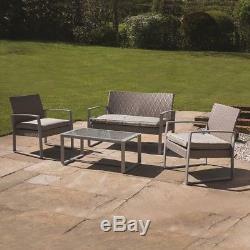 4 Piece grey rattan effect garden furniture patio set. Comprises of 2 seater sofa and 2 armchairs complete with grey fabric seat cushions and rectangular tempered glass top coffee table. Removable covers for easy cleaning. Includes step by step instructions. Seat height from ground: 40cm. Chair: H75cm x W58cm x D65cm. Sofa: H75cm x W102cm x D65cm. Table: H37cm x W78cm x D40cm. 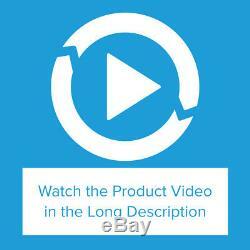 Wido 4 Piece Grey Rattan Furniture Set Product Video (FSRG) - YouTube. Wido 4PC GREY GARDEN PATIO RATTAN CHAIR/SOFA OUTDOOR FURNITURE CONSERVATORY. CANCELLATION IF YOU CHANGE YOUR MIND WITHIN 14 DAYS. You may cancel your order without reason at any time up to 14 days after the day you (or someone you nominate) receives the goods. If goods are split into several deliveries over different days e. Your order will be cancelled when we receive the request from you. If we havent sent the goods to you before your order is cancelled. If the goods have already been sent to you at the time of cancellation. You can return them by:(i) delivering them to us yourself or posting them to us at Wido Limited, Customer Services, Kingfisher House, 9 Glaisdale Parkway, Bilborough, Nottingham. The costs of returning the goods to us are paid by you. GOODS NOT OF SATISFACTORY QUALITY, NOT FIT FOR A SPECIFIC PURPOSE YOU HAVE TOLD US ABOUT OR THAT HAVE BEEN MISDESCRIBED. You may reject the goods within 30 days of the goods being delivered. Unless you return the goods to us, we will be responsible for the cost of returning the goods. Please do not arrange to return your item to us unless you have prior confirmation from us, as the cost of the return may not be covered in this case. You must allow us a reasonable amount of time to repair or replace the goods. We do not have to repair or replace the goods where the costs of doing so would be disproportionate to, amongst other things, the cost of the goods. Please do not return defective goods to us without our prior consent, as return costs may not be covered. Instead of rejecting the goods or asking us to repair or replace them, you can retain the goods and require us to reduce the price of the goods by an agreed amount. Please check this listing page carefully as the answer is usually there. The item "Wido 4PC GREY GARDEN PATIO RATTAN CHAIR/SOFA OUTDOOR FURNITURE CONSERVATORY" is in sale since Tuesday, April 24, 2018. This item is in the category "Garden & Patio\Garden & Patio Furniture\Garden & Patio Furniture Sets". The seller is "wido-uk" and is located in Nottingham. This item can be shipped to United Kingdom.